From the videogame To Heart 2 comes this wonderful 1/8 scale statue of Manaka Komaki. Adorable shy Manaka comes dressed in a frilly maid outfit and awaits your order! A floor-patterned square base is included. To Heart 2 Another Days: Manaka Komaki 1/8 Scale PVC Statue stands 7 ¾” tall and is accompanied by the original Japanese window box packaging. 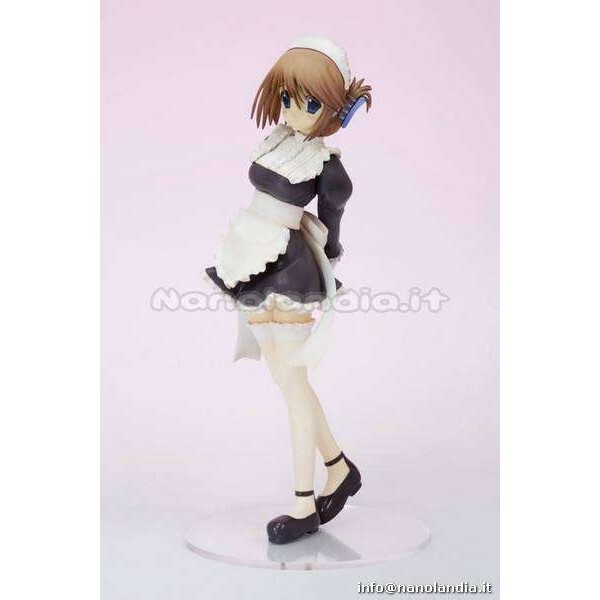 Manaka Komaki is one in a series of new Maid Costume figures based upon the illustrations of Misato Mitsumi and Mr. Amazuyu; each figure in the series is accompanied by an interlinking base to enable a group display. Manaka Komaki is clad in an blue-black hip-length maid uniform with thigh-high stockings and buckled shoes. A wave of her reddish-brown hair is clipped back with a barrette to reveal a delicately judicious countenance dominated by dark blue eyes. Manaka’s personality, in contrast to that of Yuma Tonami, is cited for shyness.